I recently revisited a really wonderful site where anyone, even me(!) can learn learn a new language absolutely free. As in no charge. As in nada. Zed. Zip. The site and teaches you a new language by letting you play games. There are written and spoken aspects — but don’t worry if you don’t have a microphone — you can easily take the courses they offer without one. But make sure your speakers work and your volume is up – so you will learn the correct pronunciation of each word. I (TC) had several years of Spanish in high school and college, I am a very rusty. My Spanish is even worse than my English and many of you think my English could use a shoe shine. But really,I’m rusty because I’m old and because I don’t need to know Spanish to say Costa Azul or Nachos con queso. Or order tacos. So mi español es muy malo. No EB, not Malox. Heck. I didn’t even know what some of those were, but I do now… thanks to my buddy Google. 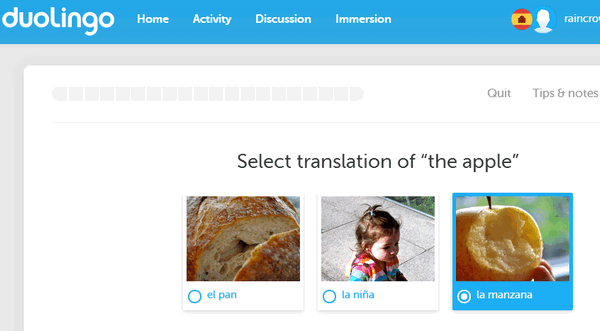 Duolingo teaches you a language by using a series of games and it’s a lot of fun. You can win lingots an trade them at the lingot store for things like getting back the hearts you lost because you missed a question. Hearts keep your lessons alive. You lose them when you answer incorrectly. When you’re out of hearts, you’re out of luck. But you can start over and try again. Those who want to learn a brand new language can start at the beginners level, those who have some knowledge of a language and who want to become more fluent, can take a proficiency test to see which level is right for them. Each level gets more sophisticated, so the learning is gradual – and did I mention it is a lot of fun? Only 96% more to go! The courses are completely free, but you’ll need to sign up for a free account. All you need to do is sign up with an email address – then choose a password. Having an account lets you stop and start lessons any time… Duolingo will remember so you can start right where you left off. ¿Estás listo para aprender español? Haga clic aquí! or Are you ready to learn Spanish? Click here! PS: Duolingo has apps for Android and iOS too. Rwy’n gobeithio y byddwch i gyd yn mwynhau Duolingo. Mae’n hwyl ac yn ddefnyddiol a dyna pam ei bod yn ein gwefan yr wythnos! I use this site for Spanish and find it very good and lots of fun. 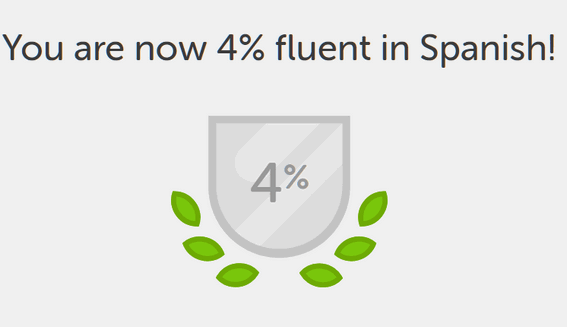 You do it at your own pace and they now have podcasts which allow you to listen to real Spanish scenarios. You can have the app on your phone or Ipad so can listen anywhere. I have also you used the French program. Love that you have picked this program. Well worth a try. Just signed up….. noticed that even at beginner level they seem to assume you know words already … like ” you, he, she” be good if they had a list of those. I understood that they have to start someone – by showing you a picture and a label we are able to associate the picture with the label. I think you really need to give the site more of a chance. It’s excellent. Irish Gaelic is listed, but not Scottish. You can learn many different languages on Duolingo, but certainly not all languages. You should write to them, not us. We just like the site – we don’t have any control over it. It would be helpful to write them and ask why they have it listed but don’t offer it.